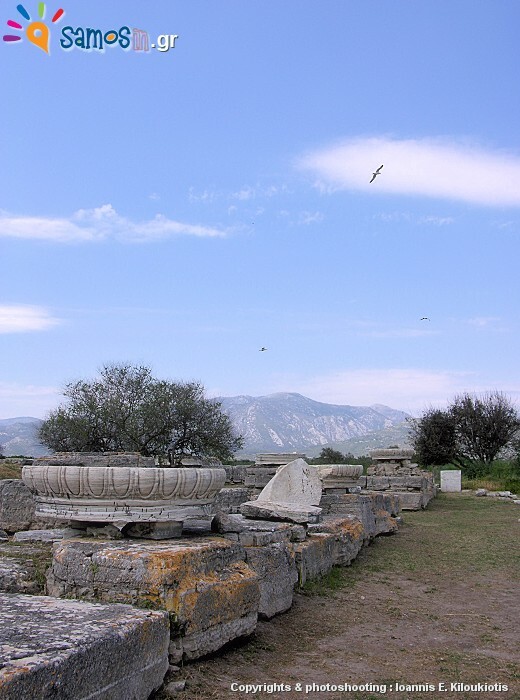 The Temple of Goddess Hera was the main sanctuary of ancient Samos, and one of the most important of the world at the time. 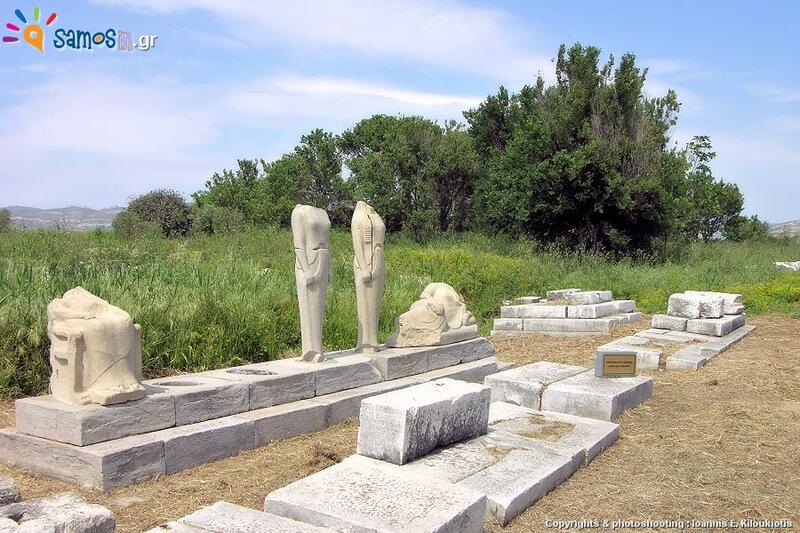 It was built on the banks of the river Imvrasos where the goddess Hera, according to the legend, was born. 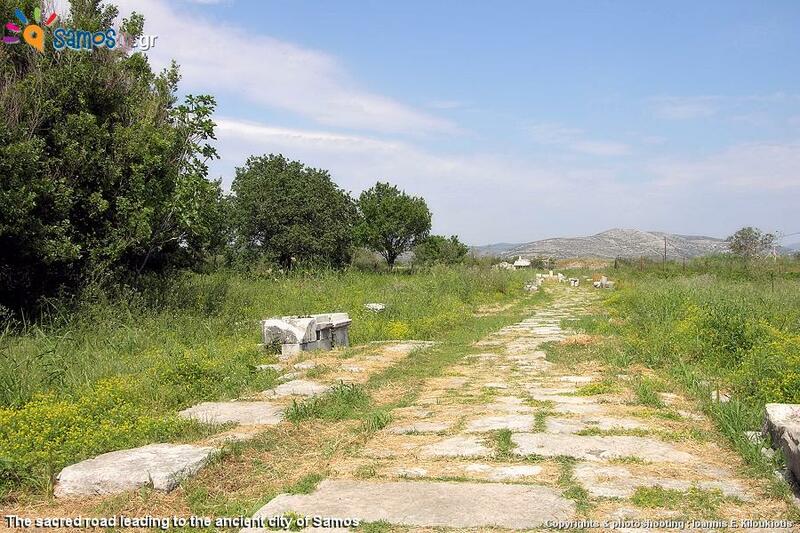 It’s located at the southeastern coast of the island and about 6 kilometers southwest of the ancient city of Samos (today Pythagorion), to which the holy place was connected via the “sacred road”. During the period of the Mycenaean civilization (1600-1100 BC), the oldest traces of the cult of the goddess Hera (or a goddess that is identical to Hera) are located in the area, but the most magnificent, “the greatest of all the beauties we have” As Herodotus wrote, the Great Temple began to be built in 540 BC, during the period of the tyranny of Polycrates (538-522 BC), by the architects Theodoros (son of Rhoikos) and Telecles (son of Theodore). 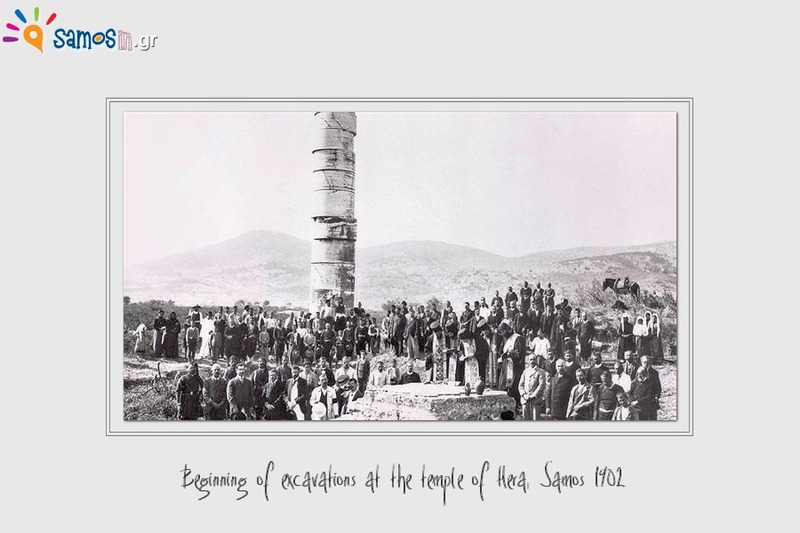 The immeasurable, for its age, size of the temple was 112.2 meters long, 55.16 meters wide and 21.5 meters high, with 155 columns in which four different sizes and types were distinguished. Today only one pillar remains standing, about half the height of its original height, an irrefutable witness to the majesty of the “Great Temple”, while from the temple’s infrastructure, it is preserved only in part till the beginning of the wall and the stilobate. According to Greek mythology, goddess Hera, the queen of gods, the goddess of euphoria and fertility, was born in the estuary (mouth) of the river Imvrasos, at the root of a wicker tree which is mentioned to have been preserved until the time of the traveler Pausanias (2nd century CE). 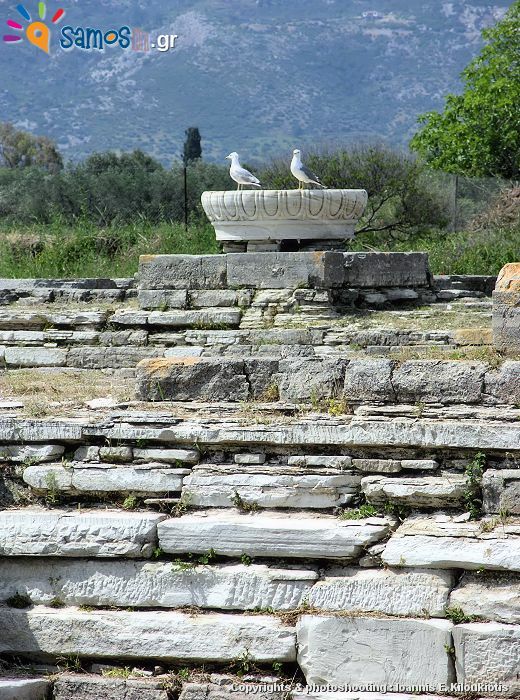 According to legend, the holy marriage of Hera and Zeus, the father of gods and people took place at the same place. At the same area, in ancient times, a wooden statue of Hera not made by human hands was found. According to this tradition, the presence of the divine was intense and the sanctity of the place undeniable, making it imperative to create a sanctuary in honor of the Goddess Hera, despite all the difficulties due to the unstable terrain created by the confluences of the river Imvrasos. 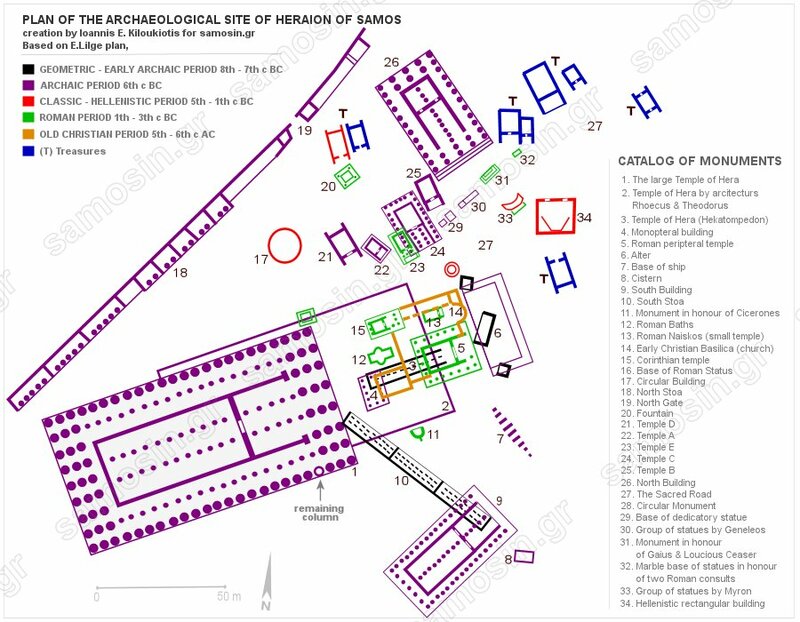 Archaeological finds indicate the successive phases of habitation of the area from the Early Helladic period I and II (2600-2300 BC) to the Late Helladic period IIC (1200-1100 BC). At this time, the oldest findings, testifying to the worship of the goddess Hera in the area, where there was a small stone altar and a temple-shaped building for the protection of the wooden statue, belong to this era. In the 8th cent. B.C. the Hecatompedos Temple was built (100 feet long = 33m) with a single inner colonnade of wooden beams that supported the roof. In the mid-7th cent. BC. 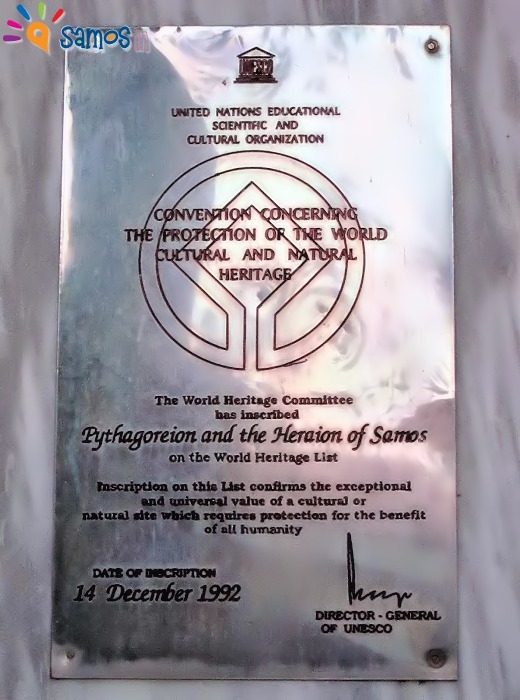 Hecatompedos II is built, on the foundations of the previous temple, with walls of carved limestone and a carved frieze, at the top of the walls, depicting warriors, part of which is preserved in the Museum of Samos. In 570-560 BC, A new temple of Goddess Hera, known as the temple of Rhoikos, was built named as such from the name of the great sculptor and architect who had undertaken its construction. The temple is considered to be a model of the large two-wimged Ionic structures with a length of 105 m, width of 52 m, height 18 m and consisted of 104 pillars. The temple was destroyed a few years after its construction, since the unstable ground was unable to support the great weight of the temple. 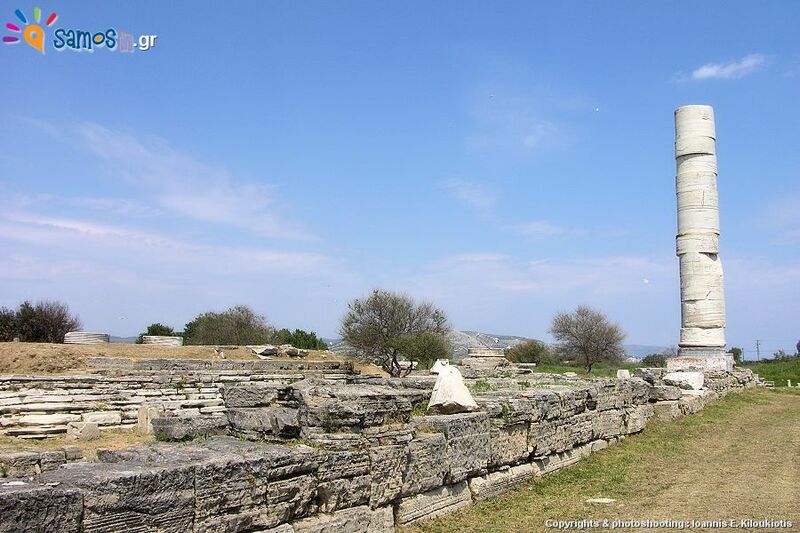 In 550 BC, alongside the temple of Rhoikos, the outdoor large altar, which was the center of the cult, with the impressive dimensions of 38.4 m x 18.7 m, is built. 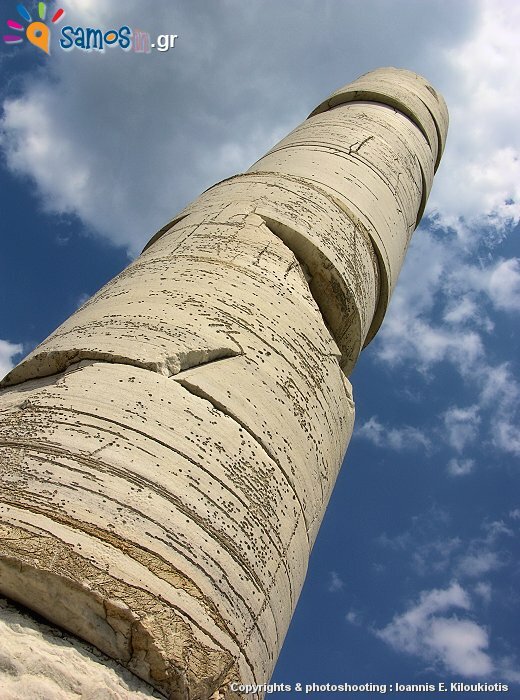 But the soft limestone from which it was constructed, suffered great damage over time and during the 1st century AD. was replaced with a copy made of gray marble. 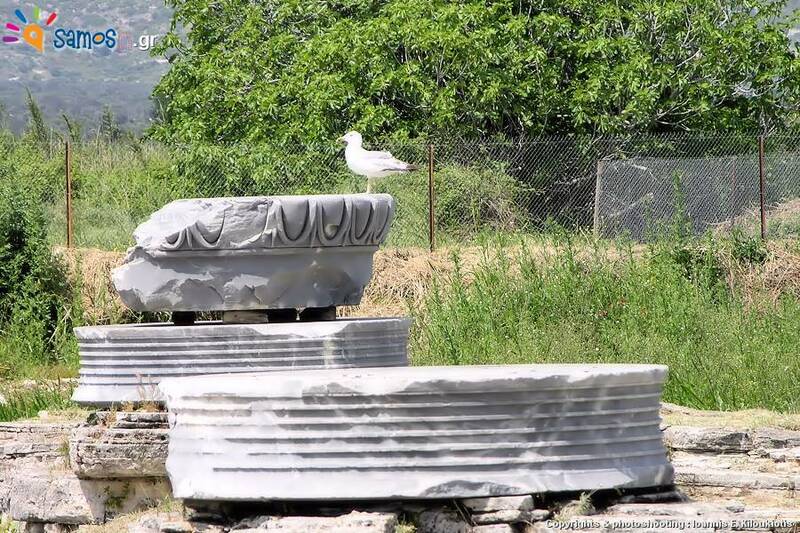 In 540 BC, during the period of the tyrant Polycrates, a new temple of the Goddess of Hera, the Great Temple or the temple of Polycrates was built, by the architects Theodoros (son of Rhoikos) and Teleicles (son of Theodoros). The temple was of Ionic style, two-winged and it had the same shape as the previous temple and slightly larger dimensions (112.2 m x 55.16 m and 21.5 m high, without the capital and the roof). All members of the old ruined Temple of Rhoikos were used for its construction. The efforts for the completion of the temple continued for many centuries (until the end of the Late Hellenistic period), but were never completed, since the death of Polycrates (522 BC) and the ensuing political instability as well as several technical difficulties caused several interruptions. During Roman times, the temple was repaired, in order to house the valuable tributes to the gods, so Strabo, in his visit to Samos in 10 AD, characterized the temple as a gallery, while the Traveler Pausanias in 170 AD characterizes the temple as ruins. Since the 3rd century AD the temple was gradually dismantled up to its foundations, by the local inhabitants, who used its members for the construction of buildings, since pieces of the temple were found embedded in buildings of the time. 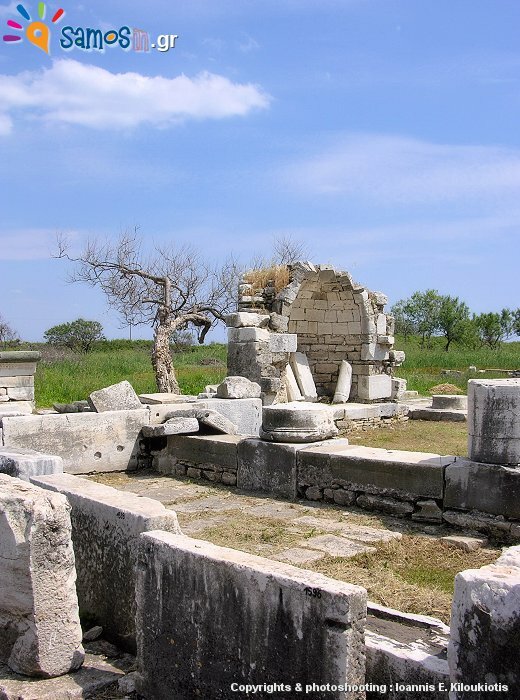 In early Roman times (about 10 BC), a new temple of much smaller dimensions (20.35 m x 18.96 m) was built in front of the altar in honor of the Goddess Hera and Lidia (the deified wife of Emperor August). The small dimensions of the temple and the co-existence with Lidia indicate that the goddess Hera and the sanctuary of Samos had lost their radiance after about 15 centuries, a sanctuary with a world-wide reputation, since the votive offerings were real works of art, and confirm the attendance of visitors from all parts of the then known world, such as Egypt, Syria, Assyria, Babylon, Mesopotamia, Persia, Phoenicia, Laconia, Attica, Crete, Cyprus…. Over the centuries the site has been abandoned and gradually covered by dense vegetation and by the floodings of the river Imvrasos. In 1702, the French botanist Joseph Pitton de Tournefort, visiting the island, recorded and made several drawings of the ruins of the temple and brought to light the first surface finds. 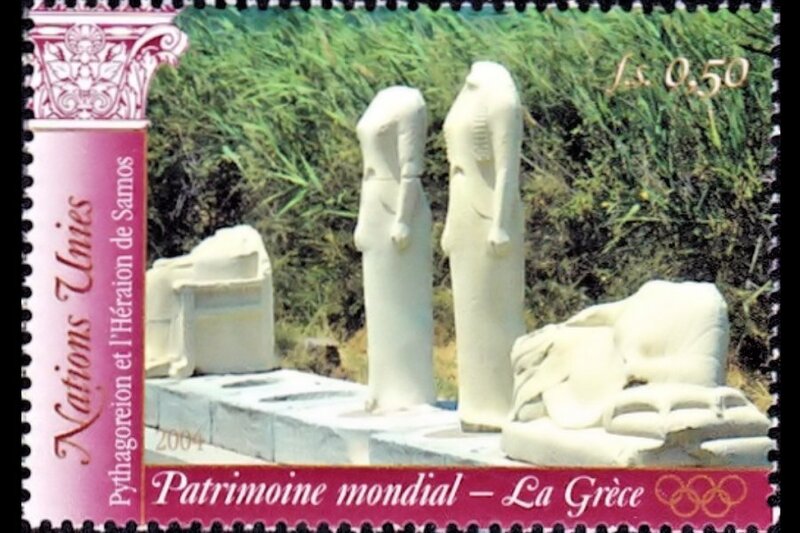 In 1879, Paul Girard, another French traveler, found and pulled out the first statue, Chiramy’s dedication to Hera (the daughters of Chiramy), which today adorns the Louvre Museum, while a second one was recovered in 1984 in the excavations of the German Archaeological Museum Institute and you can find it at the Archaeological Museum of Samos. 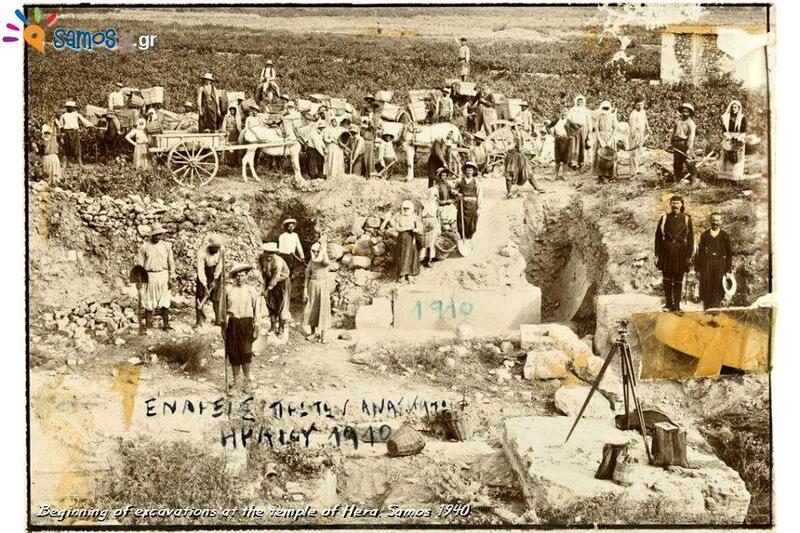 The first systematic excavations were made in 1902 by the archaeologists Panagi Kavvadia and the Saminan Themistoklis Sofoulis, who continued until 1910 followed since by the German Archaeological Institute of Athens, which continues the excavations until today. 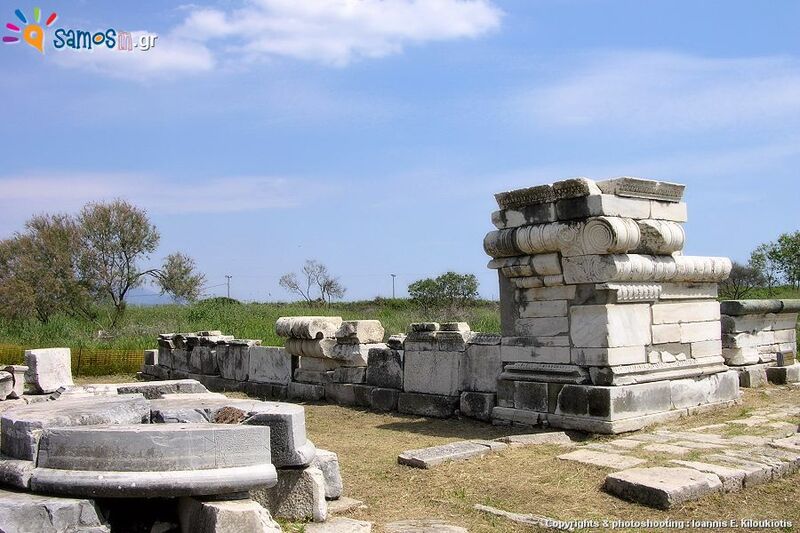 The temple of Hera, is classified by UNESCO World Heritage Monument since 1992. “Temple of Hera” Virtual Tour (interactive panoramas) for construction of similar type temple. 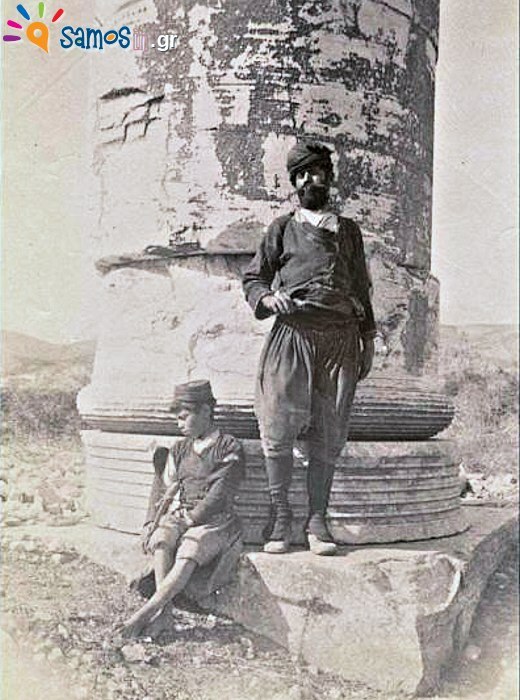 The temple of Samos is almost double than this in the video. 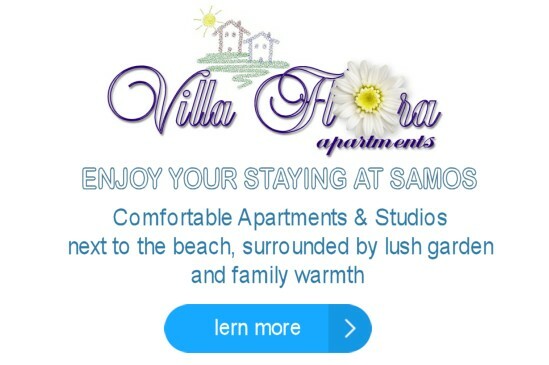 Closed at 25th & 26 th of December, 1st of January and 25th of March.